There are over 200 types of arthritis , rheumatoid and osteoarthritis being the most common to affect the fingers and joints. Finding and choosing the right secateurs for arthritis sufferers can be confusing, especially if you have no experience with gardening tools. Swollen finger joints and hand pain can severely affect the ability to carry out the simplest of garden tasks. What once was an enjoyable passion now becomes a chore and a painful one at that. Pruning with arthritis is one of the most repetitive gardening tasks. The one that is going to cause the most irritation and strain on arthritic joints. There are however better secteurs that will aid a user with arthritic hands than others. The use of secateurs can not be avoided in a planted garden. When carrying out those pruning tasks a secateur that is going to give the maximum output for the minimum effort on hands and joints is needed. This should be a rule for every gardener, not just those with arthritic hands. Buy cheap and you will buy twice! Some secateurs work better for some sufferers than others. You may be lucky and find the right pair straight away. Alternatively it may be needed to purchase 2 or 3 pairs before finding the right one that is most comfortable. The solution is out there, it may just be a case of trial and error. The blade on a secateur should be of excellent quality and always razor sharp. This reduces much of the force needed when pruning. If you have a razor sharp blade and still find the force needed is tiring or causing pain then stop. There may be another garden tool, such as a lopper that is more suited to the task. Felco offer an ergonomically designed secateur. We believe Felco to of been the first to develop a unique rotating handle. This secateur is available in both left and right hand versions. The rotating handle spreads the force across finger joints, reducing stress and making the secateur more comfortable to use. 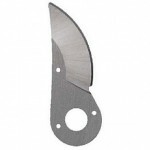 Felco blades are made from carbon steel. They are very sharp and stay sharp for longer between sharpenings. 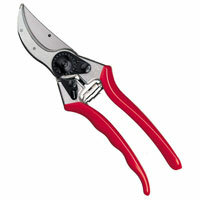 Felco secateurs are the professionals choice in horticulture and worth every penny. Click here for the Felco Model 7 & 10 Ergonomic secateur. Fiskars have launched a secateur with both a rotating handle and their patented PowerGear technology. The handle is constructed from lightweight, reinforced fibreglass. The blade is corrosion resistant and has a non stick PTFE coating, lessening the added resistance from friction. Fiskars are making ground in garden tool supply. These secateurs are worth looking at. Priced from £20.00. Click here for more info. Powered by a rechargeable Lithium ION battery. The Bosch CISO cordless secateur powers through small branches. Giving approximately 500 cuts per full charge this electric secateur is really suited for the shrub and fruit garden. Prices from £59.00. Click here for specification and to buy. Hopefully this article has proved useful in your search for secateurs for arthritis sufferers and those with arthritic hands. This list will be added to when more suitable products are found. With the appropriate care your secateurs should last you a lifetime (providing you don’t loose them under a bush, we’ve all been there). Having a very sharp blade will produce clean, healthy cuts on your plant material and make light work on your joints, lessening the force needed. There are many sharpening stones and specialist secateur sharpening tools. I find a simple sharpening stone to be a very effective method. I would recommend after every use to wipe the blades with some warm soapy water, thoroughly dry and a quick pass with a sharpening stone. It’s a good idea to have a pre oiled cloth to wipe over the blade to prevent rust. Keep the spring oiled at all times. There’s nothing worse than secateurs that refuse to open and close properly. Also the spring is the one component that is more likely to rust so a few drops of 3in1 oil works a treat.